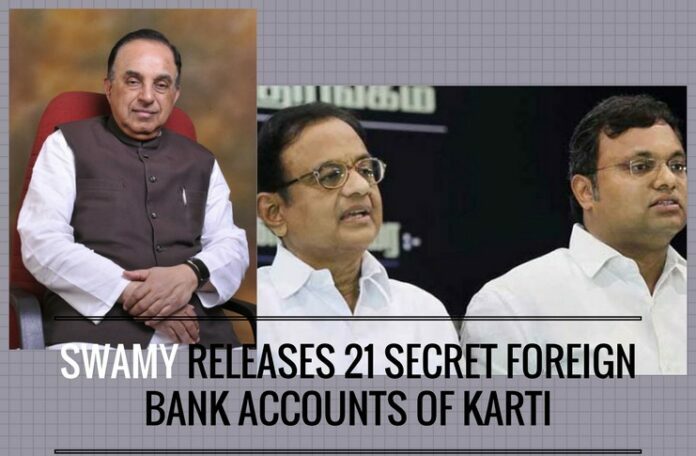 Senior BJP leader Subramanian Swamy on Monday revealed former Finance Minister P Chidambaram’s son Karti and his companies’ 21 secret foreign bank accounts. Releasing the details to media, Swamy accused the Finance Ministry and Income Tax officials of inaction on this blatant illegality. “The attached list shows all bank account numbers of Karti controlled companies. For the past eight months, Income Tax office in Chennai has not taken any action due to the pressure exerted by Chidambaram’s friends in Finance Ministry,” said Swamy producing the 21 foreign bank accounts of Karti and his companies in various countries. Swamy said that this list was given to him by a whistleblower officer from Income Tax office in Chennai previous week, explaining the amount of pressure put on them by corrupt elements in Chennai and Delhi. He is operating this account secretly for many years, said Swamy. One account (No: 16714313) in Metro Bank in the United Kingdom is a personal account of Karti and he has not declared this to Income Tax in his annual statements till date. He is operating this account secretly for many years, said Swamy. “His company Advantage Strategic Consulting, involved in receiving kickbacks in Aircel-Maxis scam is having four accounts in a Bank in Singapore, namely OCBC for many years. Enforcement Directorate (ED) has already found that Karti’s company Chess Management received two lakh dollars from three Maxis Group subsidiaries after father Chidambaram illegally approved FIPB clearance,” said Swamy. Swamy’s revelation of Karti’s secret bank accounts is a big blow to Chidambaram family as well as Karti. He has not declared any of his foreign bank accounts in the affidavit to Election Commission when he contested for Lok Sabha in 2014. Karti’s affidavit to EC is produced at the end of this report, which shows only his bank accounts and businesses in India. Swamy also blasted CBI and ED for not acting against Chidambaram and son Karti in the Aircel-Maxis scam. He asserted that “certain” BJP leaders are trying to dilute the Prevention of Corruption Act. Swamy said he would oppose this move tooth and nail and move amendments in Parliament. In addition to the above revelations, Swamy also revealed his correspondence with Prime Minister Narendra Modi on the investigation of the Aircel-Maxis scam, in which the Supreme Court had placed the entire burden on him to prove Chidambaram’s guilt. In his letter, Swamy blamed the attendant Law Officers representing the Government in this case of not presenting any of the necessary documents and in effect complicit in the corruption of Mr. Chidambaram. One wonders how long it will be before we will see a new Attorney General! A copy of this correspondence can be accessed at the end of this post. Previous articleIs the Finance Ministry covertly attempting to grant Rs.1600 crores to GSTN? Yes, there are weak links within the BJP that have to be protected. What is the point in writing books such as C-company or D-Company. We have to ponder over why stalwarts like Arun Shourie, Yashwant Sinha, Shatrugan Sinha raise against the Modi Raj. Even the mild and moderate long standing Bengal Rajya Sabha MP Chandan Mitra. has jumped ship. Modi tends to listen to Amit Bhai and Arun Jaitley and there are small clubs within the BJP Delhi command who would not like to proceed too fast to bring the closure of all pending cases. D-Company gang has all the details of the BJP members who have received their support. Like DMK – AIADMK, in the state of Tamilnadu, BJP and Congis+Comic Commies will alternate to be in power to carry on the loot. Feel very sorry for Dr. Subramanian Swamy, Dr. Sree Iyer, Dr. Nalapat. Sonia-Rahul-Vadra as well as P.C-Karti dynasts will roam freely in the Delhi Darbar. Swami’s tall claims that they would hold their CWC meeting in Tihar having Dosa would remain a joke. When 2019 arrives, Swamy will be ridiculed remaining in difficult straits unable to fulfill his commitments. Indian Judiciary, Bureaucracy overtly and the BJP covertly would turn down the punishments. It is all victory for the C- and D- Companies in the 21st Century modern India. 2-G verdict is a living example of what is coming. Let Dr. S. Swamy keep day dreaming. next step what these banks are going to do . Sri Iyer: i) The deafening silence of Modi on the PC/Karti Corruption matter, ii) the swift rapid responses from Arun Jaitley on all other subject matters who keeps putting out blogs on less important matters as late as July and August 2018 BUT not dealing with/speaking about the inefficiencies in the Ministry of Finance on matters pertaining to the inordiate delays on P.C. Kartigate Case File, iii) FM Dept. Bureaucrats stalling the court proceedings iii) Repeated Judicial clearance and extension of BAILS for both Karti and PC clearly CONFIRM, BJP and Modi’s inner Caucus does not want to proceed rapidly. People are losing Confidence, Trust in BJP and Modi. A water tight case is presented by Dr. S. Swamy and why such inordinate delays. Justice DELAYED is Justice DENIED. All the people are hand in g louse. And the most important fact is that our courts are so lenient that people of this sort get bail without any problem. People who should be in jail are languishing outside enjoying all the benefits. For Ex: Sonia, Rahul. Akhilesh, Maya and so on . Any politician of a particular political party normally protect other politicians under all circumstances. So is the present day politicians as well. People are fools and idiots to believe that the corrupt politicians are punished by the agency. Even the Judiciary was unable to get the corrupt punished. The latest example is 2g case judgment. Even Mr Vajpayee Government at the central level did show the death and murder to whistle blower Engineer in the Road project. What the present government with previous loyalists of congress party at the operation level can do with corrupt politicians? Nothing. Only Kerala type rainfall and flooding of rivers and natural calamities in elimination of all good bad and ugly will bring the change in the country. God alone can save the people. Respected Sri Swamy, Why not start a movement of Arrest Karthi and Chidambaram in TN and bringing all these facts to the people of TN. Today, these PC’s are as though not done anything wrong and roaming. The protest should bring all these in the form of a book so that it can reach the bottom of the downtrodden. Please direct us as to how to take it up. We need people like PGURUS. Comandable job. U and many more including Vora commission has written in the past.. no denial of this fact. But the question is ‘should v leave after writing?’. The current form of democracy is designed by cronies politicians, for the politicians, to the politicians. Time is to think about changing this democracy to suit our illiterate INDIAN population (majority). Please brain storm with like minded people to find ways to do it because these politicians whether BJP or Congress will never bring any bill in parliament which is against their interests. We have seen this empteen number of times that all political parties join hands whether ruling or opposition when the matter regarding their interests comes. Common man has no say in this system except a (useless!) vote every 5 years and more frequently now and then. Please do me a favour, brain storm with your friends to find out ways and means to accomplish this highly complex task. Swamy has indicated that the Govt is not proceeding speedily enough even after having all evidence is in their hands.This shows up the incumbent government in a very poor light especially when they have promised to act on Black money and foreign accounts. The gov had earlier published information on money that has been recovered from many people but surprisingly no mention was mad of karti n co. What stance will Congress now take as they have been screaming in parliament that no action has been taken by BJP on foreign black money? Would they refer to this disclosure and censure PC and Kartik? Swamy is well versed in Politics and sees the Fin ministries Slackness as a deliberate action to safeguard PC n Kartik and at the same time maybe malign the clean Modi government for dilly dallying. It is time for Swamy to be given more powers to push forward BJP agendas. He needs to be seen on stage with PM n other Ministers and also to be allowed to speak on all issues . Keeping him and his programs on the back burner will only backfire. Swamy will not put up with any Bull whether outside his party or within. Nation first. I am surprised that even Pioneer and Sudersan TV or Yuva is not discussing these issues in detail and building on it. BJP election strategy never mentions any of this? Swamy may need to demonstrate his strong support by many Indians . He should conduct a major meeting in Bombay with like minded Akbar n Nalappat n Tarekh Fateh, n Gen Bakshi n Matjor Jadav n Sushil n others . Conduct it in one of the maidans. Thanks to Dr Swamy to bring such reavelations. Unfortunately, there are no such other persons (?) who can follow his foot steps with precision & passionately persue these kind of political scandals. Request Modi government to ensure that Stern actions are taken and take such cases to its logical conclusions. Problem is Beurocracy .. during congress rule… They make beurocrat system worst.. These people are not good enough … Many of them are appointed by congress only to get personal gains..
you are great and you are going to hope of general public for fighting against corruption. Love you and lots of regards Sir. What is the use of it in India? Any assurance of taking action? What about the past cases? Not only in Tamil Nadu no action has been taken so far all over India. Is it possible to punish any corrupt politician here within a short span of time? Justice differ nowadays from man to man, party to party. No use to reveal those things. Its utter waste of time. Respected Dr Swamy , I would like to see and hear you in the Rajya sabha, when you strongly oppose the move against dilution of the prevention of corruption act. Can you please intimate on twitter as to when it would be so that i can watch it either on TV or on computer? Thank you Sir from an old man in advance. Katju has become senile,he shouldn’t forget that he was a part of the system till his retirement.Now barking left right and center demeans the high office he held.It shows that the man was impotent when he could have done something and now bristles probably thinking what a jelly bean he was when he had the power to do something to change this rotten system. Thanks Dr Swamy. You are a fearless great man. Now that you have exposed the corrupt, let the Indian nationalists moblise its people to demand action from the Government. Really Great .Nation rebuilding cycle is in progress .such families need to be exposed as they are still shamelessly attempting to be in lime light by their statements against Army / Nation .Such families need to be fully exposed to prove the damages caused to the Nation for their vested interest to remain in power. All who can provide related proof must come forward and support further damage . SHRI Modi ji we look for another surgical strike on such issues to provide strong message that such acts will not be tolerated. Need rejection from the society .Pl help Dr Swamy ji Who has taken up such issues in the larger interest . Friends we are leaving comments, but do you think prime minister Modi does not know all of these. As Mr. A K Patra commented, he might have his weakness. After all he is also a politician and he has to safe guard his party BJP. The surprising thing is that how shameless Mr.Chidambaram and son . If we would have been there in their place we will commit sucide. Who will punish these guys? All official are with them. Hats off to Swamy ji. You please guide us how we can support you to make this movement more stronger. if he is such an honest truthful man for human justice how come he remains well silent at the genocide of an Indian community in Gujarat in 2002 because they belonged to another religion? What happens to his concern for human rights and justice then? He is a bigot and a hypocrite, dishonest and hateful as he is. Maybe very soon Karti will flee the country like Mallya in collusion with AJ ,and LOL, AJ may even accompany him. Subramanian Swamy must be appreciated for his fighting spirit. Shameful that Government is not acting against corrupt Sonia-Chidambaram families. Hats off to Drswamy and to the IT officer who gave him all these informations…..follow thoroughly the root cause of all these evils……hang them in the street as per modern law. CAN ESCAPE FROM THE CLUTCHES OF LAW. CONFISCATE ALL THE ASSETS AND ATTACH IT WITH CONCERNED DEPT. LET KARTI PROVE HIS INNCENSE, IF HE REALLY IS, AND CLAIM THEM. Dr Swamy! You are a Great! All in this family are involved in cheating the country? Even there is ED and CBI notices to Ms Nalini Chidambaram for charging over a crore of rupees from Sharadha Chit Funds for allegedly giving legal advice? All know about the Ishrat Jahan Case, where the same person modified the second affidavit to aid the Pakistani Terrorists. The files I believe are missing so that there is proof to prosecute him for anti national activities. He takes umbrage to the Statement of Army Chief, who has rightly called those who, interfere with Anti Terrorists operations in the valley will be dealt severely. One officer could not be evacuated due to stone throwing mob and he succumbed to injuries. Though he called the statement of Army Chief intemperate he had no word of appreciation to the brave four who died in the operations. Sanctimonious! My Dear Press! why the hell you give importance to this person and publish everything he says in newspapers and TV Channels. Don’t you know by now how good or bad he is? If he really meant good for the country would he and his family hide their income and avoid paying income tax? Need to expose these persons and make them accountable. It looks These are all game plan of BJP with full knowledge of Mr.Modi. If not Our PM Mr.Modi should act fearlessly with every corrupt politician and baurocrat. We have waited almost three years but nothing is happening and only general public have to suffer. Have you heard of such cases even being filed in the past? Did Lalu go to jail so conclusively as he did today? Only pseudo-congis and commies who were eulogising these idiots for 60 years while they were looting the country will show extreme impatience with man who has stirred the hornet’s nest and has taken on looters. why can’t Modi atleast sack AG like Donald Trump if he is not compliant with his vision? We feel that Modi only talks about corruption,but no action. Only small fishes are punished and big ones are allowed to escape.Is Modi helpless? He has to pull up his socks.Otherwise again corrupts will bounce back.Shameless PC writes and advises everybody,but his own lung is smelling like he’ll. Only God save us. What use ? Even Modi is not interested in prosecuting the corrupt. BJP for its leaders except possibly swamy should write a book “Spineless in Govt”.. Immediate nationalization of accounts and seizure can serve some purpose, not through decades long judicial process where there is all likelihood of culprits escaping through loopholes in the prosecution process. Pm is directly responsible for it . Yes , PM is directly responsible for it . If not, Jaitely should be sacked immediately. Otherwise clear that the PM has been compromised. Which means he should step down. ha ha,, not as straightforward as your vadivels low brow comedy.you are weaned on your evrs/karunanidhis/mgrs/jjs so i understand your thought process.You must jump out of this cess pit of brain to understand some serious higher good things that is going on. Will the authorities take any action or separate rules for so called corrupt VIP politicians. Corrupt congress made every deptt.corrupt since 3 generations. no hope. Dr. Swamy is a greart anti-corruption crusader, but given the level of corruption in India, maybe we need a 1000 Dr. Swamys. May his tribe increase! And may God give him a 100 years of healthy life. we dont need 1000 Swamy, we need just one real 56″ Modi to start catching big crooks. Thats it. Rest all will fall in line. I doubt Mr Modi would assist.He might hv some weakness in pursuing scams of Congis. All the corrupt people should be severely punished, whoever he/she may be and whichever party he is related to.The Income Tax Officers,who collaborated with them must be relieved from their duty with immediate effect.The Whistle Blower should be rewarded.l am commenting on this subject for the first time in my life.I have not copied from any one I am assuring in the most modest and honest tone.Is that clear.